The Oxford (Ohio) Community Foundation invests funds for charitable organizations and offers them a chance to earn above CD rates on their money. It’s investments are directed by an august board of directors composed of people with long years in the financial industry; three of Miami University’s former treasurers are on the board. Organizations that wish to place their funds with OCF are presented with literature that speaks highly of the success of the directors’ management of the funds entrusted to them. As illustrated below, the portfolio for OCF is well diversified. Here is a look at how the funds are allocated. There are 56 securities in the portfolio. 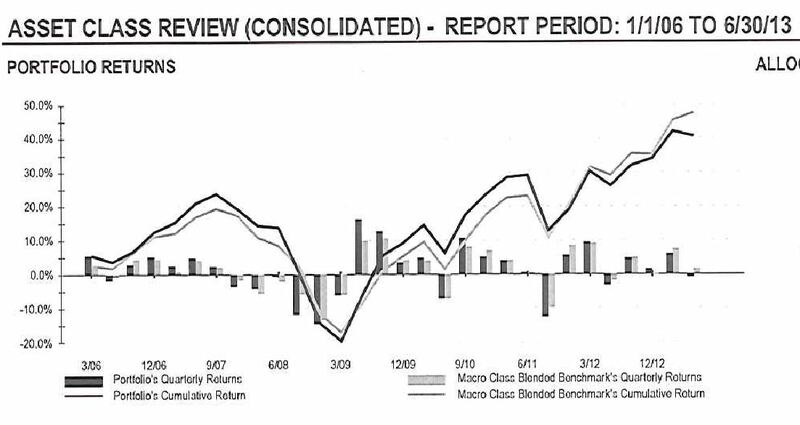 All data is taken from their consolidated report prepared by their broker, First Financial Wealth Management. Now let’s look at the bottom line of all their efforts. What About the 2008 Market Crash? The OCF portfolio on 9/07 had gained 22% over it’s initial value. By 3/09, it was down 19% below its initial value. That is a swing of 41% from high to low. The DIA had a swing of 53% from its high to its low. To add insult to injury, the Foundation’s Cumulative Return is currently BELOW the Benchmark Cumulative Return! It might appear that in a really bad downturn, a diversified portfolio is better. But only relatively speaking. If the investor would have had to liquidate his portfolio at the bottom of the crash, the investor in DIA would still have had more money available because he had accumulated more from the start than did the OCF portfolio. He started losing 53% of a higher number and so his portfolio still was more valuable than the OCF portfolio. And, we are never talking about total liquidation of an account. The investor who is investing to build wealth in a retirement portfolio never liquidates his account. Since the bottom, DIA has well outperformed the OCF portfolio and it doesn’t matter that at one point the OCF portfolio lost a smaller percentage than did DIA. From the above, you can see that the total portfolio yielded 2.17%. 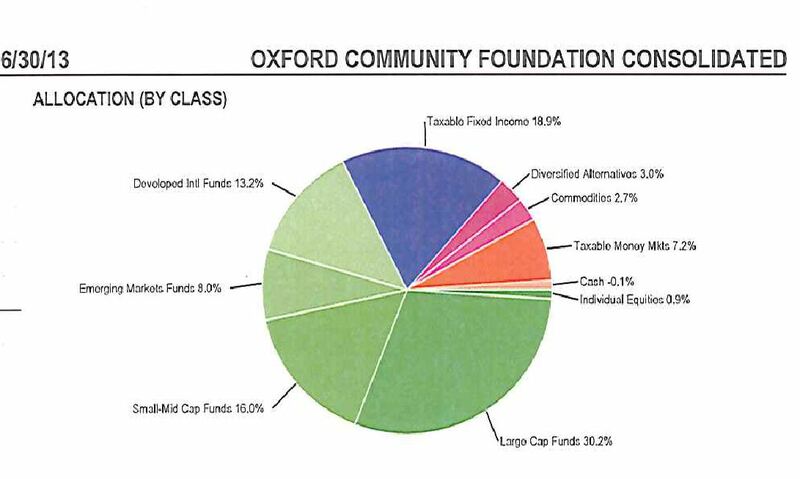 What I haven’t told you yet is that the Oxford Community Foundation charges a management fee of 1.5% of your invested assets. That reduces your effective yield to 0.67%. Hardly worth bothering, especially when one knows that the yield for DIA is 2.34% with NO management fee.